Those of you who’ve been paying attention may remember the assertion I made in my review of Kill List this morning that the film ‘makes exemplary use of Helvetica’. Well, since then I’ve received messages on Twitter (primarily from a man by the name of @topfife) suggesting that the opening credits and intertitles in Kill List are in fact rendered in Arial. As you can see in the illustration above, it can be quite hard to differentiate between the two (spoiler alert: Arial’s at the top) and as the titles are not replicated in Kill List‘s trailer I have no way of knowing for sure which typeface is used without seeing the film again. 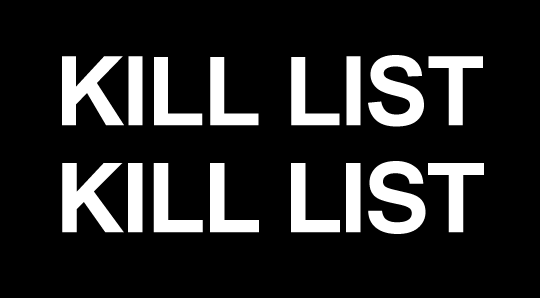 It should be noted however that the Kill List ads currently running on this blog use Arial. Can you settle this matter once and for all? Please get in touch immediately via Twitter, Facebook or e-mail. Together we can put an end to this rampant speculation. The final word there, from Kill List director Ben Wheatley.